TPC of Myrtle Beach is not an official PGA Tour TPC facility (it lost that designation when it lost the Senior Tour Championship). 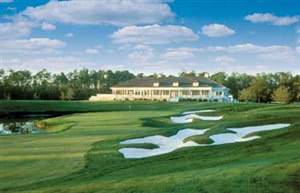 It is now in the hands of private owners although the PGA Tour allowed it to retain its TPC brand. Designed by Tom Fazio, TPC Myrtle Beach is the only course along the 'Grand Strand' to have been awared 5 stars by Golf Digest. Following a terrible period last year when the original bentgrass greens suffered very badly the course was closed for over two months during which time the greens were entirely relaid to improve the drainage and converted to Mini-Verde Ultra-Dwarf Bermuda Grass, the same that is found on the TPC at Sawgrass. The rest of the course is largely untouched from the original Tom Fazio design meaning a very picturesque course with tree lined fairways which wind through lush wetlands (water comes into play on 10 holes) and with greens that now drain as well as any and are better able to remain in the top quality expected of a 5 star course. The course has also earned the status of a certified Audubon Cooperative Sanctuary meaning that the course is shared with nature, egrets, great blue herons and swans can all be seen along the way. Visitors are welcome and are assured of a level of service second to none.